Democrats averted a nasty public fight Sunday over a controversial Iron Range copper-nickel mining proposal that has vividly split powerful factions of the party. In the end, activists on both sides came to the microphones to urge hundreds of feisty delegates to delay the vote indefinitely…. Which is a victory for the party’s anti-development majority, and a rebuff to the people of Minnesota’s Iron Range. PolyMet officials have pledged to invest $650 million initially and create up to 360 high-paying mining jobs if they get state and federal approval. They expect to infuse another $500 million annually over the projected two decade life of the mine. Other companies are already lining up to tap what they have found to be one of the world’s largest untouched deposits of copper, nickel and other precious metals used for everything from smartphones to hybrid cars. Local officials are hoping the area is on the leading edge of a mining resurgence on the scale of the oil boom in North Dakota. Sounds great, right? That is what the people of northern Minnesota think. But their “green” party has a more or less religious commitment to suppressing development of mineral resources, and at this point, Democrats from outside the Twin Cities are an afterthought. Leftists love smartphones and hybrid cars, but they don’t want to develop the mineral resources that make those products possible. The mining issue will play a huge role in this year’s Congressional election in the 8th District. Minnesota’s 8th Congressional District, historically a Democratic stronghold, was represented for many years by James Oberstar. He was defeated in 2010 by Chip Cravaack, but in 2012, a presidential election year, Rick Nolan unseated Cravaack. Nolan is a DFL retread, an elderly man who represented a different district in Congress quite a few years ago. He is eminently beatable. Nolan is being challenged by Stewart Mills, one of the owners of the popular Mills Fleet Farm stores. We helped launch Mills’s campaign when we publicized his video about the 2nd Amendment. We also wrote about Stewart here, after he announced his candidacy for the 8th District seat. I think Mills is a terrific candidate, and I believe he will win. 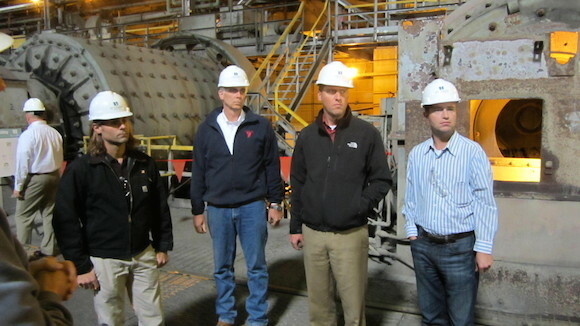 He is shown in this photo, at left, at the PolyMet Mining facility. I have contributed to his campaign, and I hope you will, too, by going here.